Five Canterbury monks saw what appeared to be a meteor hit the Moon, possibly the Giordano Bruno crater being formed, but questions remain. Current oscillations of the Moon's distance, on the order of meters, may be a result of this collision. C. H. F. Peters discovered asteroid #188 Menippe. Jacobus Cornelius Kapteyn, (19 January 1851 - 18 June 1922) was a Dutch astronomer, best known for his extensive studies of the Milky Way and as the first discoverer of evidence for galactic rotation. H. Julian Allen of NACA Ames Laboratory advocated the "blunt nose principle," significant to ICBM nose cone and Mercury capsule development, which proposed a blunt shape would absorb only 0.5% of the heat generated by reentry into the atmosphere. USSR launched Luna E-1A No.1 (a.k.a. E-1 No.5 or Luna 1959A) from Baikonur, an attempt to reach the Moon and impact its surface. However, the inertial system failed at T+153 seconds and the vehicle was destroyed by range safety. NASA's Space Shuttle "Enterprise" carried a crew aloft for the first time, in a captive active flight, attached to the modified Boeing 747 Shuttle Carrier Aircraft. The flight from Edwards lasted 55 minutes 46 seconds. C. Shoemaker discovered asteroid #2891 McGetchin; and E. Bowell discovered asteroid #2569 Madeline. 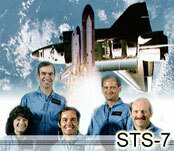 NASA launched STS 7 (Challenger 2, 7th Shuttle mission) with Dr. Sally Ride aboard, the first American woman in space. Perth Observatory discovered asteroid #3541. Comet Churyunov-Gerasimenko, which became the target of the ESA's Rosetta mission, passed through perihelion. The Astra 1H was launched from Baikonur on a Proton booster, and positioned in geosynchronous orbit at 19 deg E in 1999.